With Sarah Walker. Including CD of the Week: Weber Overtures; Brainteaser: Only Connect; Artist of the Week: The Nash Ensemble; Sarah's Essential Choice: Bartok: Dance Suite. with Sarah Walker and her guest, Master of St Peter's College, Oxford, Mark Damazer. A selection of music, including the Essential CD of the Week: Weber: Overtures - Berlin Philharmonic, Karajan, DG. We also have our daily brainteaser at 9.30. 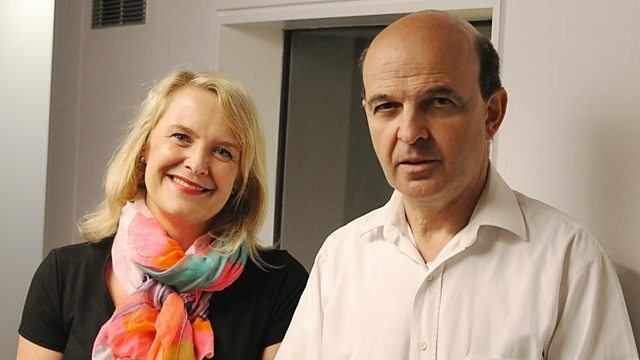 In the week marking the 800th anniversary of the formal creation of the role of Chancellor of Oxford University, Sarah's guest is Mark Damazer CBE, Master of St Peter's College, Oxford, and former controller of BBC Radio 4 and Radio 7. Previous to these posts, Mark had an extensive career in news and current affairs journalism working at ITN and at the BBC - in the World Service and on news programme such as Newsnight and the Nine O'Clock News. Later he was responsible for the BBC's news and current affairs journalism from Westminster, including Question Time, and Yesterday in Parliament, becoming Deputy Director of BBC News in 2001. He was made Commander of the Order of the British Empire (CBE) in the 2011 New Year Honours for services to broadcasting. Mark is a Board Member of the V&A, and of the Centre of Contemporary British History. He currently writes columns for The London Evening Standard and The Guardian. Mark suffers the misfortunes of Tottenham Hotspur and enjoys opera, gardening and Italian painting. Singer: Roderick Williams. Performer: Iain Burnside. Orchestra: Scottish Chamber Orchestra. Conductor: Jaime Laredo. Performer: Philippa Davies. Performer: Roger Chase. Performer: Skaila Kanga. Singer: Mikael Melbye. Orchestra: Staatskapelle Dresden. Conductor: Colin Davis. Singer: José Carreras. Singer: Mirella Freni. Orchestra: Berlin Philharmonic. Conductor: Herbert von Karajan. Performer: Tempesta di Mare Chamber Players. The connection was the Flute.